The only sure way to protect your village is to send someone to the stones of knowledge. On them the ancients have carved the music of fire and water which will protect the radius of the village from lava/fire and flooding/tsunamis respectively. Each level requires the knowledge to be relearned by a villager but it can be passed from village to village within the level and you can have both songs of knowledge going at the same time. Once the painted kite is tied to the totem that village is safe, you don't have to do anything extra but they will still scream when something is coming at them. Music plays a fairly large part in this game as far as the story goes. The tribe believes that by learning the music of the elements you gain the power to master them. So if your village is protected by one of the songs of knowledge when danger comes near the villagers will break out the drums and something that sounds like a didgeridoo and the danger will be kept at a distance and just pass around them. While affective this could also mean that those in the village are now trapped there, possibly forever, depending on what's happening. You could end up with a village completely surrounded by lava so you have to pay attention to where things are naturally flowing and when possible move stuff out of the way. Really though, when you're starting out right at the mouth of a volcano there's only so much you can do. You'll never start with less then seven men and as the difficulty of the levels increase so does your starting number of men, but you'll only ever need five men to reach the doorway to continue. Five is also the minimum number of people needed to erect a village so as soon as you fall below that number you've failed the level and it will give you the option to quit or restart. Each level adds in new dangers and progressively gets harder. As you move through you will encounter various plants and animals that can both help and hinder your progress. 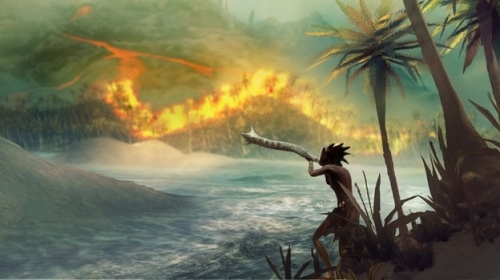 Things like fire trees, exploding bushes, water plants, prickly plants and a creature called 'the destroyer' that will eat all the vegetation in it's path. These mixed in with the elements create a sort of 'rock-paper-scissor' set up for the game. There are also 30 bonus time challenges that are unlocked by finding artifacts within the levels and getting 100% vegetation on the map. They're all things you will find in the original story mode like putting out fires, rebuilding at the totems and getting knowledge passed between villages but you may only have one element available to use and your results can be matched up against your online friends. Completing this game requires patience; sometimes the only option you have is to wait. Given the villagers' small size in relation to the maps, progression is often a long and difficult process . They'll usually get stuck somewhere on the way but they're call for help and an arrow will appear so you can help them out. Occasionally they won't actually be stuck on anything but they usually figure out how to get moving again all on their own. The only real complaint, and it's barely a complaint, is that when the maximum amount that can sucked in (be it water, soil or lava) is reached, it can be hard to see where you're putting it down. That said, a quick flick to the camera joystick will give a birds eye view and fixes the issue. It will take a few retries to get through this game, but the re-playability is impressive because there is no proper way to beat the levels and it leaves much to the player's imagination. 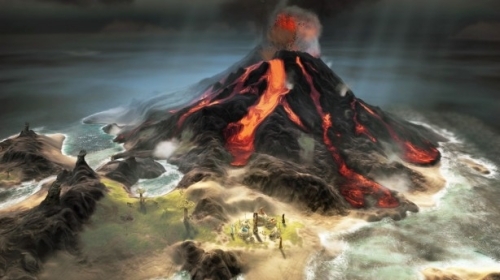 In addition, a sandbox level gives the ability for to play God, as you can create your own map, complete with waterfalls, volcanoes and tsunami attacks. All told, From Dust is a superb god-simulator. Maps are challenging, without ever reaching the point of becoming frustrating, and the sense of scale is unparalleled. A unique spin on the god-game formula, that never becomes boring or repetitive. 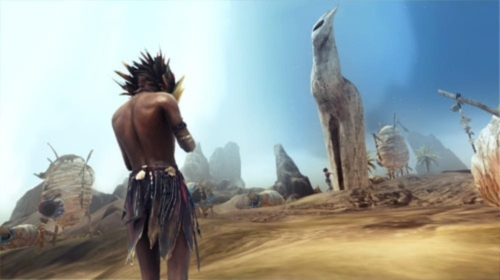 Overall matched to the surroundings, the soundtrack makes it easier for the player to ascertain the safety of a given village. Stunning visuals in an ever-changing environment. Easy to learn and even easier to master. 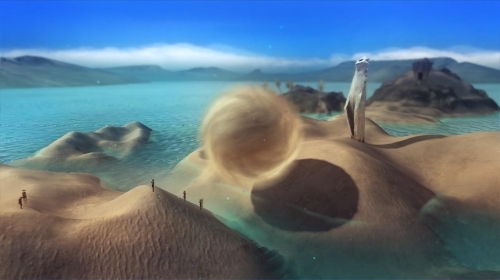 A god simulator that is as beautiful as it is engrossing. With deep gameplay, large environments, and ample replayability, From Dust provides hours of entertainment.